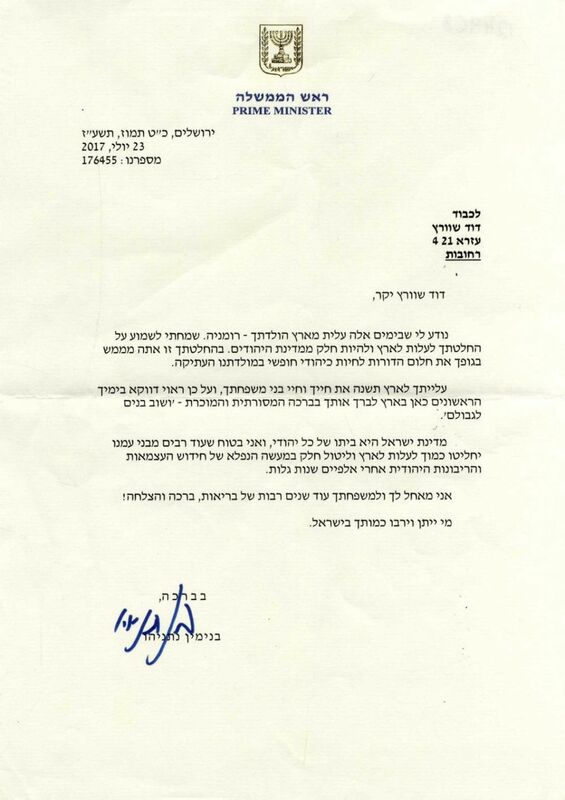 Letter from prime minister of Israel, Binyamin Netanyahu. Written in a personal, encouraging style to Mr. David Schwartz who immigrated to Israel from Romania. 29 Tammuz 2017. Netanyahu writes: 'I was happy to hear about your decision to immigrate to Israel and be part of the Jewish State. With this decision, you are realizing the dream of generations with your own body, to live as a free Jew in our ancient homeland ... The State of Israel is the home of every Jew, and I am confident that many more of our people will choose as you have, to immigrate to the Land and take part in the wondrous deed of the renewal of Jewish independence and sovereignty after 2000 years of exile ..."
Netanyahu's signature is in the margins of the letter.